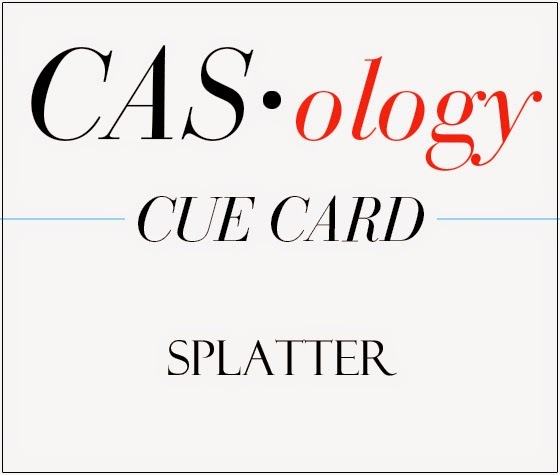 This week's CASology Cue Card is Splatter! Well, splatter and CAS don't necessarily go together, do they? But as long as there's white space, your card can feel clean even if you love to use messy, ink-on-your-fingers techniques! Then, because I wanted to create a small, matching border around my main panel, I used the same inks and sponged them on to the cardbase with an ink blender tool. My sentiment is a PTI Wet Paint die cut. Simply, perfect! Love the splatter! Stamps like that are made for those of usu who don't like to get mucky!! Love this Ardyth! Fantastic use of color and splatter. I love your two toned look. Love, love, love. Am going to have to peak at Jennifer's video too. love that splatter and the two inking technique! Gorgeous! Love the two toned splatter and matching border! I love how you created your matching mat paper! Love the big splatter in the middle of the card. Cool two-tone splatter, great matching border. I adore that die cut sentiment, too! Super awesome inkiness LOVE the two tone technique!!! Brilliant - love the 2 tones. Gorgeous results! I just watched Jen's tutorial & I'm quite sure she would give you an A+ and a few gold stars for your project! Are the splatter and the sentiment both PII? If not, they sure do work well together. Great inked border! Love the dimension that two-tone stamping creates! I really need to practise that technique! thanks for sharing the link to Jen's tutorial too. I love the colors! Gorgeous spatter effect...very cool card!